Recently I received a message from Leigh who is doing a Masters in Creative Writing. She is writing a personal memoir bringing to life the 80′s nightclub scene of her late teens/early twenties to life. She is very keen to find out if this is fact or fiction. Or in other words if this is fact or did she have a few too many beers and imagined it! So Clubbed Out readers can you help? Did Robert Smith (lead singer of The Cure) visit The Tube Club (Lands Office Hotel) after his 1984 concert at Festival Hall, Brisbane??? If anyone can remember please let us know. Leigh believes he turned up pretty late. If anyone has any recollections of this happening please let us know. Stay tuned as the club list will be updated soon. Thanks to everyone who offered suggestions. If you could please include years that you recall clubs going for an even an actual address this can help in compiling the list. 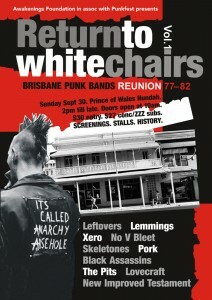 For those of you who liked punk bands and that great bar White Chairs, a special reunion day is just around the corner. “White chairs” for those of you who don’t know was located at the back of the Carlton Hotel in Elizabeth Street. It used to be the Carlton Hotel’s Public Bar. This building was one of the many great buildings we lost to the truly awful Myer Centre. In the late 70′s through to the early 80′s White Chairs was a meeting spot for many a Brisbane punk before heading out to live gigs. The beer was cheap and the bar was pretty packed with leather, mohawks, coloured hair, studs and chains. Screenings will be upstairs above the band area, in a chill out zone and there are over 800 pics and 21 videos to feast your eyes on while resting your ears. The bistro bar will be playing all the hits from back in the day as well. It’s bound to be a biggy!!!! Sunday 30 September at the Prince of Wales Hotel, Nundah. Doors open 10am. Hi to you all. I know it’s been a while between drinks or posts but I hope to keep you up to date about what you are sending me. In the coming weeks the club list will be updated and we will post more pics. 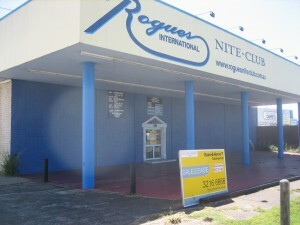 Special thanks to Kyle for this one… Rogues International, now there’s a club! You can’t get anymore international than Underwood and Rogues set its sights on being the classiest club you could get in the ‘wood. Before Rogues however the club that existed was Caesars Palace. They had a great jingle “Caesars Palace, the ROCK HEART UNDERWOOD! !” The last three words were meant to be shouted as that’s what this place was all about. Rogues continued the tradition especially with their amateur strip night for both ladies and gentlemen. Now there’s a way to meet the locals. When Kyle sent me through this pic I was a little sad that yet again another clubbing institution has said bye bye. Although if any of you are keen there is a business opportunity awaiting for you! Please let me know your memories from this great venue. By the way Kyle has informed me that there was a Caesars Palace in Ipswich that hosted an amateur strip night as well. Does anyone know about this? If so were the two venues run by the same people? We’d love to know. Thanks to everyone who came along to the Brisbane Square Library for the talk and also those of you who have seen the Clubbed Out display. If you haven’t been in to the library yet, you still have time as the display has been extended until the end of December. There is also a selection of radio 4zzz memorabilia so it’s well worth a gander. Details are below in Show and Tell. In undertaking this research for Clubbed Out quite often I am annoyed at how many hotels and venues have been demolished. We have really lost some fantastic buildings that made the town so special (don’t even get me started on that souless Myer Centre!). 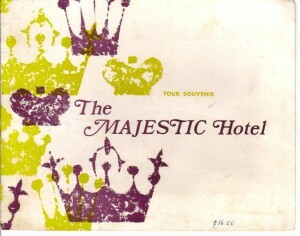 One of my favourite haunts in the 80′s was the Majestic Hotel. We had many a great night there especially when the Move kids ran it. I remember having beer served in a pilsener glass, this was very classy! The music was great as well. 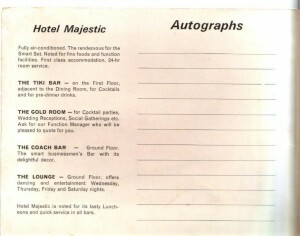 I also used to go to the hotel for a great counter lunch and I would also have many a fine cocktail in the stunning cocktail bar. Well the wrecking ball came along and took away yet another great venue. Matt has kindly sent through a photocard from around 1968/69. Just click on the image to enlarge. I like that they promoted the hotel for the “Smart Set”! I also love the choice of bars – where are the Tiki Bars now for the Smart Set? Thanks Matt for sending these through. I’ll post the National Hotel one soon too. I thought as we approach the New Year it would be nice to post this picture of NYE at Images. 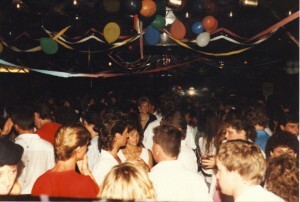 When all you needed was balloons and streamers to dress up a club! Enjoy. We will be putting some more great pics up in the coming days. We have a request from Troy and I am hoping someone can help us out. Troy met his wife at the Roxy in the Valley in 1987. I remember the Roxy then… It was pretty packed and had the two levels and tried to be super swanky. Well Troy would love to see a picture of the club back then not to be romantic, but to show off the sleazy place they met in! I love it!! So if you happen to have a pic or any further stories on the Roxy, let me know. Personally, I preferred Patches which was upstairs with a separate entrance. It also had a great ceiling too. And, really good music if memory serves me correct.